Contact Us - Home Theaters And More Inc.
Home Theaters and more was established back in 2004 by two brothers, Darrin and Clay Brun, both life long residence of Billings. Home Theaters and More has partnered with many other specialty providers to enhance the companies ability to be a one-stop shop for all your home integration needs. We have carpenters, drapery makers, electricians, lighting, faux painters, alarm installers and many other trades that we can work with so that we can coordinate a full solution very efficiently. 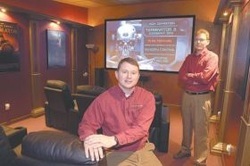 We want everyone to enjoy the benefits of having their own home theater. A home theater can be as simple as a television and surround sound system in the living room to a dedicated room featuring the latest and best components and decor available. Our mission is to provide quality solutions that work efficiently and are easy to use!